HOUSTON (Feb. 15, 2017) – During the biggest night in football, one warrior served by Wounded Warrior Project® (WWP) was able to experience the action up close. 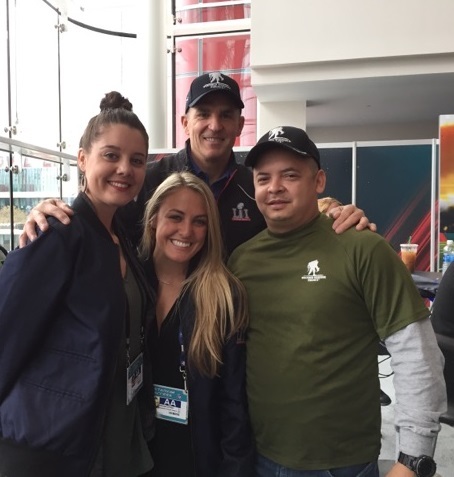 While attending an event hosted by USAA® and the NFL, U.S. Marine Corps veteran Marcelino Gonzalez was chosen as the lucky winner for two free tickets – donated by the NFL – to Super Bowl LI. He and his wife enjoyed the game, close to the field – and another prominent attendee. While Marcelino and his wife are both Texans fans, they decided to each pick a winner for the game, igniting a friendly rivalry that carried through the four quarters of play. The NFL also donated 50 tickets to warriors and their families to attend the Pro Bowl in Orlando, providing them an opportunity to connect with other veterans in their area. These bonds create important support systems that help warriors recover from the wounds of war. It’s a feeling that Marcelino is familiar with, as he experienced how WWP serves veterans long before he registered with the nonprofit. Marcelino was injured during his tour in Iraq, which has taken a toll on him financially and physically. “Having a limp at 35 really makes you feel old,” he explained. However, while attending events with WWP, he saw other young veterans were struggling too. It was a situation that comforted Marcelino, despite the circumstances around it. Isolation is one of the most significant struggles wounded warriors deal with after serving their country. It can be difficult knowing how to overcome that challenge and rekindle bonds similar to those formed in the military. In a WWP survey of the injured warriors it serves, more than half of survey respondents (51.7 percent) talked with fellow veterans to address their mental health issues. To find photos from this event, click on multimedia, then images.